Sometimes a pudgy pup is cute. Unfortunately, excess pounds puts your dog at risk for health problems. It is important to maintain a healthy weight for the entirety of your dog’s life. 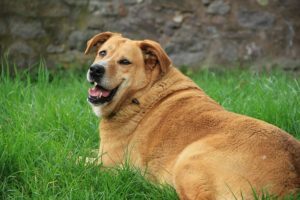 This is how to determine if your dog is overweight and what to do about it if the answer is yes. There is no one-size-fits-all solution to your dog’s weight. Different breeds have different weight standards and silhouettes. However, you can use a body mass index (BMI) calculator to determine if your pup is at an unhealthy weight. This chart from the American Kennel Club (AKC) shares the typical weight by breed. The AKC data provides a starting point for thinking about your dog’s weight. 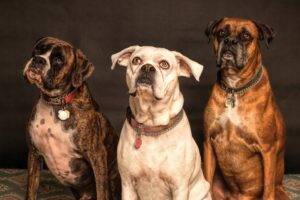 What dogs are at most risk? Spayed or neutered dogs may have a greater risk of gaining weight because of the change in metabolism and loss of hormones. On the other hand, the survey found some breeds, like sighthounds, appear to be resistant to obesity. Just like people…there’s always that one person who can eat anything and never gain a pound. Ugh! 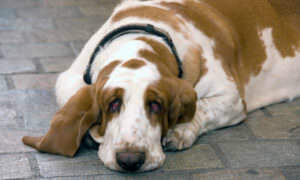 Even a small amount of extra weight can be quite harmful to your pup. VCA warns, “As few as five pounds above the ideal body weight can put your dog at risk for developing some serious medical conditions.” Once your pup is overweight or obese, it is almost guaranteed they will develop secondary conditions. However, sometimes obesity indicates other diseases. For example, an overweight dog may indicate hypothyroidism (an underactive thyroid gland) or Cushing’s disease (overactive adrenal glands). Dogs gain weight the same way humans do, eating too much and exercising too little. Make some adjustments to your pup’s lifestyle to help them shed extra pounds. First, talk to your veterinarian if you decide to start a new diet for your pup. Then, think about what you are feeding your dog. Do you give him table scraps at every meal? Do you feed him his daily meals and many treats during the day? Cut down the “human” food you share with your pup. Count how many treats you give him in a day. Reduce your pup’s daily calorie intake by decreasing treats. The American Kennel Club suggests replacing your dog’s second meal of the day with a mixture of low-sodium green beans, some kibble, and a doggie multi-vitamin. Reminder: do not make these types of changes to your pup’s diet without consulting a vet. Don’t just reduce the amount of food your dog is eating. Feed your pup a product that has lower overall calorie density, while still maintaining a nutrient balance. Talk to your vet about the right food for your dog. Once you’ve selected a new food, make sure you are consistent. No cheat days for your dog! 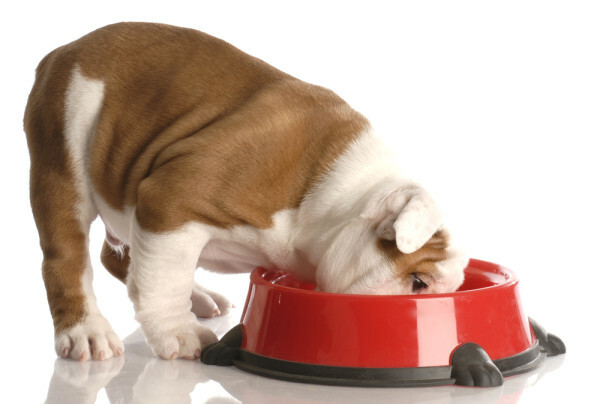 There are even foods specially made to help your dog lose weight. We’ve said it before, we’ll say it again: always talk to your vet first for recommendations and help developing a plan. There are lots of ways to get your pup moving. You can get fit together. If you don’t have the time to work out with your pup, let them exercise indoors. Send your pooch to doggy daycare to interact and play with other dogs. Yes, running is a type of exercise, but it is important to remember that not all dogs are able to run long distances. Think about your pup’s age. Puppies and young dogs can damage their joints by running on hard surfaces like concrete or asphalt. Puppy dog eyes are hard to ignore. Don’t always indulge a pooch begging for table scraps or an extra treat. It’s extremely important to be vigilant about your dog’s weight because obesity can cause serious health problems.